Fernwood has become a destination. People and families are choosing to move to Fernwood, drawn by the personality and character of our neighbourhood and our vibrant village. 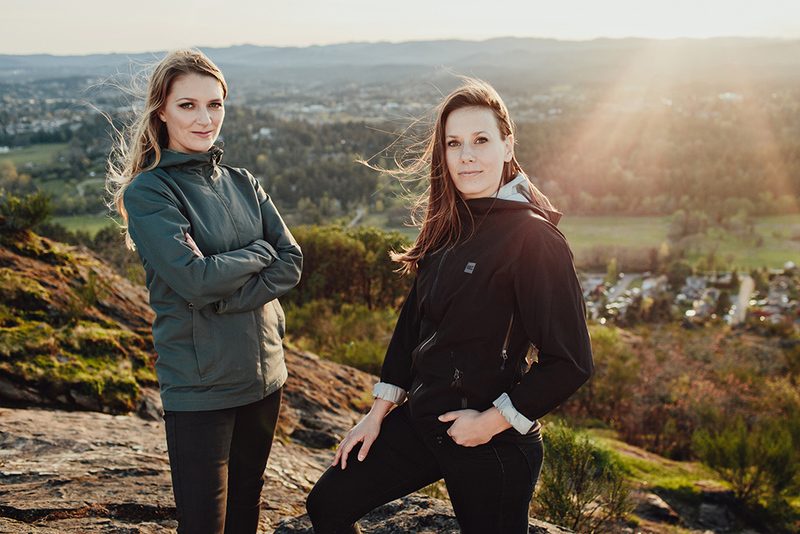 This is a big change from the rough times we saw here fifteen years ago and is a direct result of the love, attention, time and money that neighbours, businesses and organizations have poured in over the years. Nobody cares about Fernwood like the people who live and work right here in our neighbourhood. As a recent example of this love and hard work, in 2013 Fernwood NRG bought a small office building on Fernwood Road and a tiny house on Gladstone Avenue. Neither of the buildings contributed much to a lively village, and the house was in disrepair. After ­considerable neighbourhood consultation, research and discussions with the City, Fernwood NRG developed the new building at 1310 Gladstone, and sold the office building to the owners of the Fernwood Inn, who opened Fernwood Pizza along with residential units and some renovated office space. This is exactly what the ­neighbourhood asked for in visioning sessions in 2004 and 2011. In 2004 the main concern was overcoming the dysfunction in the village core—derelict buildings and struggling businesses. In 2011, our neighbours reiterated the need for more housing and commercial space, and asked for a focus on food security to be added. We acted in 2013 by buying two properties in Fernwood ­Village before they were put on the market. The redevelopment has taken more than five years, but now we have the results; the Village has changed for the better—and all the better because it was done sensitively by people who care about this place. So now there are six new apartments, an active restaurant, office space, community space—and a beautiful commercial space that was just right to allow an established neighbourhood business, The Yoga Den, to expand. This was all made in Fernwood—championed by Fernwoodians and funded with dollars controlled by Fernwood. Most of the people who have moved in either already lived in Fernwood and were ­looking for a different situation, or were working in the neighbourhood and now have a shorter commute. This is how a neighbourhood economy can work when it is stewarded by people who care. We could have done even more but we were limited by our resources. 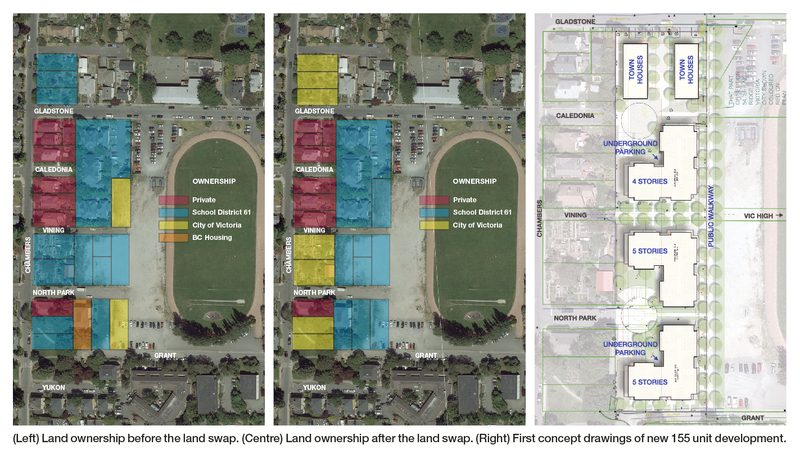 ­Fernwood NRG also had an option to purchase two adjacent houses and hoped to develop more affordable housing, but after ­exploring options with the City Planning Department and engaging with neighbours, we decided to let the option lapse in 2015. Both houses were eventually sold. One was refreshed and repainted while the other was redeveloped as a duplex, adding one further housing unit to the village. Canadians are generous givers. According to a recent report by ­CanadaHelps.org (an online charitable giving platform), the average per capita donation is $259. This means that if Fernwoodians give the same average amount as other Canadians, collectively the neighbourhood is donating roughly $2.5 million to charity each year. These donations support critical work in communities across Canada. And there is lots of critical work happening right here in our neighbourhood. Fernwood NRG has well-used programs supporting children and families, as well as neighbourhood projects that strengthen our local area. 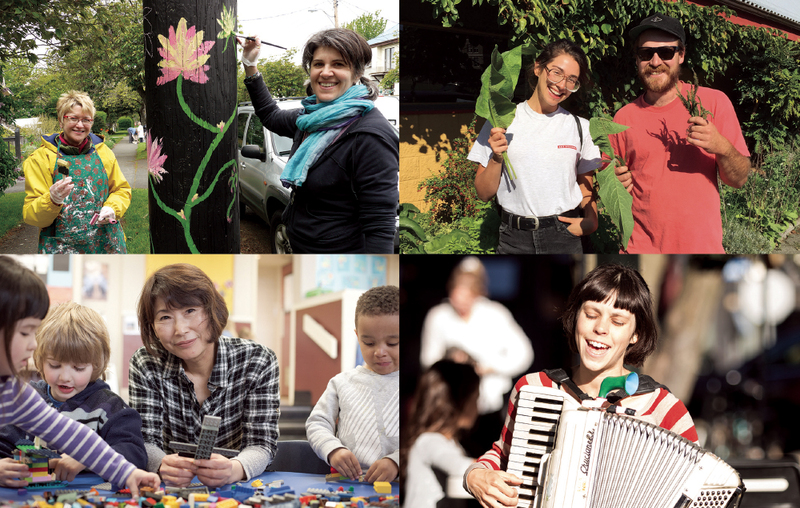 The Fernwood Community Association hosts theatre and arts ­programs, the Compost Education Centre is a neighbourhood gardening resource, and the Belfry Theatre is a premiere arts organization in the city. There are so many great projects running in our neighbourhood and all of them would appreciate your help. But we know ourselves best, so let’s talk about a couple of Fernwood NRG examples. In 2011, one of the directions from the Neighbourhood Visioning Session was to increase food security in Fernwood. 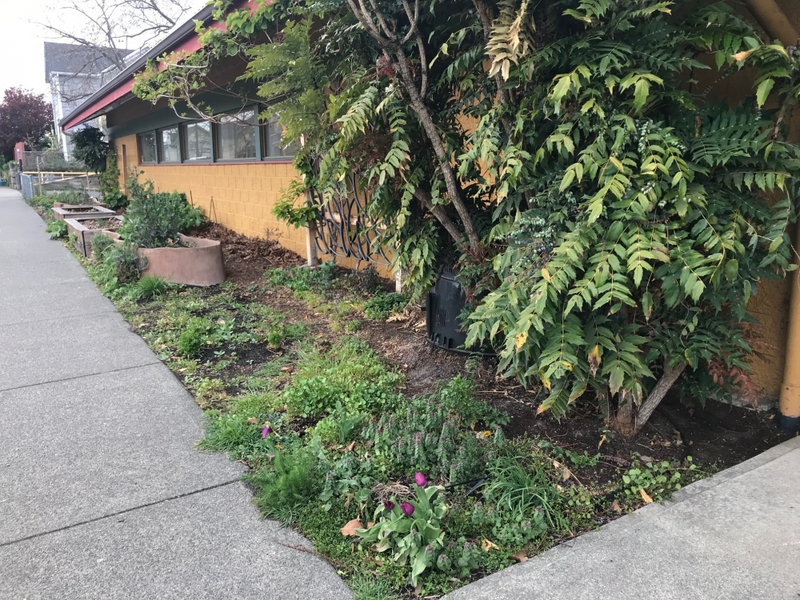 Since then Fernwood NRG has managed a City grant to maintain Spring Ridge Common, has planted a community orchard in Stevenson Park, and has planted gardens in three separate areas around the Community Centre. 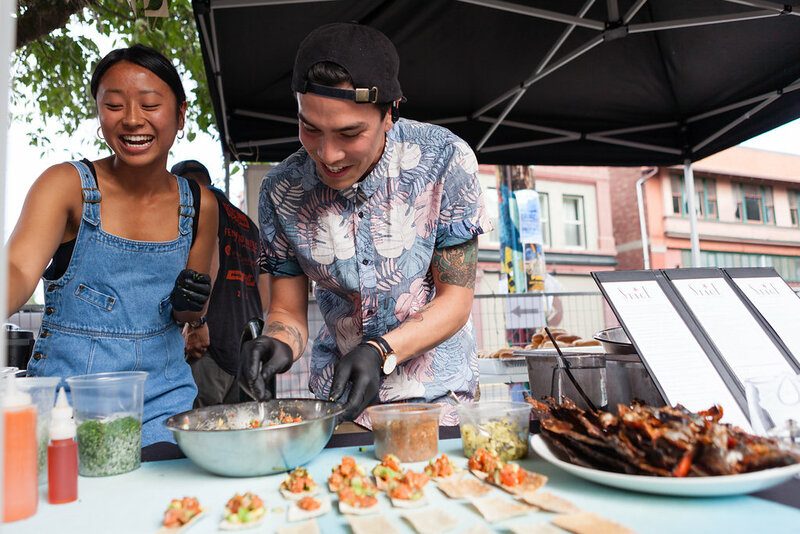 In addition to these—ahem—grassroots actions, Fernwood NRG is the distribution hub for the Coalition of Neighbourhood Houses’ food rescue program. Food is donated from a logistics company, ColdStar Solutions Inc., and is shared among participating centres. This rescued food, along with weekly produce donations from the Food Share Network, is a very important part of our Family Dinner, which has been served at the Centre almost every Monday night for the past five years and has provided nearly 20,000 meals so far. We wanted to expand by offering a ­Student Dinner on Wednesday nights, aimed at middle and high school students with a good dash of college and university folks thrown in as well. In the last school year we did manage to produce a weekly student dinner, but it almost killed our chef. The Community Centre was built with a rudimentary 1980s kitchen and ­producing meals in these higher volumes was more than a challenge. Over the past five years, we have been finding small grants and contributions to allow us to upgrade the kitchen to support the growth in our meal programs, and last year we were finally able to find a grant that allowed us to buy a commercial oven which has made all the difference in our capacity. For years, lack of equipment limited the services we could provide to people who need them here in Fernwood. In 2000, Fernwood NRG received a generous donation of a house on Fernwood Road, which hosted our Family Programs for several years. But in 2005, we were able to trade it as the down payment for the purchase of the boarded up Cornerstone Building. We subsequently renovated the Cornerstone to make room for the great businesses there today, and we turned the upper floor into four affordable, family-sized, three-bedroom suites. So, we were able to take action on a pressing need thanks to a generous donation years earlier. We used that donation to build equity in the Cornerstone, a substantial ­neighbourhood asset. In 2008, we leveraged that to build six more affordable three-bedroom townhouse units on Yukon Street, the Park Place Apartments. Things slowed down considerably after the Global ­Financial ­Crisis hit later that year, and we were only able to begin work on the new building at 1310 Gladstone in 2013. Five long years later, it is completed and includes four new apartments. Part of the lag in completing the project was just due to its complexity—but some of it was just because we didn’t have as much financial freedom as in past ­projects. Real neighbourhood investment dollars would have made a huge difference. 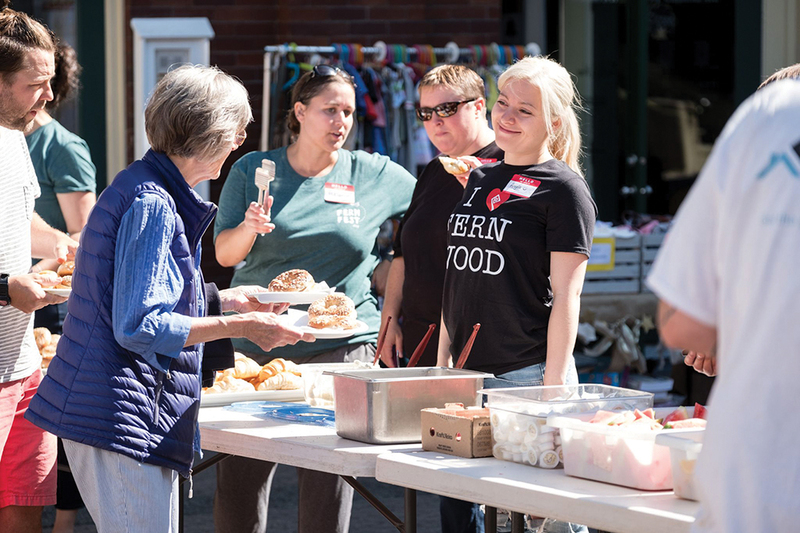 Your Neighbourhood Resource Group is a vehicle to invest in our neighbourhood; your donations reach neighbours who need them, and go to projects that strengthen our village and our community. And again, it is not just us, there are other groups working for the greater good of Fernwood too. So here is what we are asking. Please go online to Canada Helps at tiny.cc/canadahelps and set up a monthly donation in whatever amount you can afford, to be automatically deducted from your bank account or charged to your credit card. This is about the best possible way to support any organization you like because more time is spent on delivering programs instead of fundraising. We urge you to do this for any issue you believe in, but we would especially like you to imagine how you can Give Where You Live, so your dollars go directly to the neighbourhood you live in and that we all love.